Nachas Week: Rachel Sarah (and Mae) | Yo, Yenta! I know I’m a lucky lady to have El Yenta Man, and my kids are blessed to have such an involved, adventurous father. But sometimes I peek over on the fence to see the single mothers hanging out, enjoying vegetarian potlucks and estrogen-dominant discussions, unencumbered by in-laws and another person’s issues or dirty laundry and I secretly envy them. I can’t help it, some single moms just make it look good. Rachel Sarah is a perfect example of that kind of single mother  she’s gorgeous, stylish, has a cabal of supportive and loving single mama friends and is raising a sassy, smart daughter named Mae on her own. 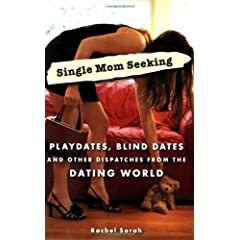 I met her when I worked at the j. weekly in San Francisco where she continues to be the resident dating columnist, and I figured her book, Single Mom Seeking: Playdates, Blind Dates and Other Dispatches From the Dating World, would be edgy, playful and well-written. But how engrossed I found myself in Rachel’s saga came as a surprise anyway. It wasn’t too long ago when people whispered “single mother” in tones reserved for terminal diseases, as if it were an affliction, or God forbid, contagious. Rachel shrugs off that stigma with barely a glance, but letting go of her idea of the perfect family isn’t so easy. Even after Eric, the emotionally unstable father of her daughter, abandons them, she continues to fantasize that every man who comes through the door might fit the corner of the “triangle.” She goes on her very first date while she’s still nursing and falls immediately into bed with the guy, conjuring up a post-coital picture of the three of them  her, him and Mae  by the second date, an image that dissolves as the dude slips out the door at 3am without saying good-bye. So this is what dating is all about: looking for red flags, obeying red flags, running like hell when I see one, asking questions, talking about myself without revealing too much. It makes me feel alternately exhilarated and exhausted. Reading Rachel’s transition from “Hey, you’re cute! Let’s do it!” to “Hmm, are you interested in children?” is almost like watching a baby learn to walk  you know she’ll get it right eventually, but you wince every time she falls. Through the process of maturing into the responsibilites that come with being a dating parent, she remains a committed mother to Mae. But she refuses to fall into the trap of martyr  she deserves to date, to sleep with whomever she likes. As long as she uses protection. It isn’t until she and Mae move back to the Bay Area and she has a full-time babysitter in her own dad that the major league dating begins; she has a tight turquoise number she calls her “first date skirt,” and as the years go on, it sees plenty of action. When online dating becomes popular, she jumps right in, organizing her dates in a binder, making another full-time job out of poring over their profiles. She enrolls Mae in preschool at the local JCC and sees that the Jewish daddies are the best around. She decides to post her own profile on Jdate, bringing a whole other dimension of mishegoss, since her father is Jewish and her mother is not, which leads some Jewish men to reject her as not Jewish. Reform Judaism is basically a fraud, one writes. Why don’t you just unergo an Orthodox conversion? Fortunately, plenty of good J-men think she’s a fine catch, and she handles this new batch of potential mates with humor and hard-earned experience. It’s so relieving when she begins make better decisions for herself; I wanted to tap her friends on the shoulder and say “What the heck were you thinking, watching her kid so she could go out with that schmuck?” Much of the humor and wisdom of Single Mom Seeking comes from these single mama friends, who are as good as  maybe even better than  family to Rachel and Mae. Her friend Siobhan imparts a nugget that she refers back to every time she’s tempted to find love in the arms of someone’s who’s not right: Never go back for more when there is only less. The crux of the book is Rachel’s growth as a mother and a woman, though her role as a lab rat in the world of single parent dating provides plenty of advice and fodder for commiseration. In the end, Rachel finds love with a motorhead Israeli with an infectious laugh, and though she had been so raw with her other loves, she closes the bedroom door on this one, “it is private.” But as a married woman, I know there’s no such thing as “happily ever after,” so I look forward Rachel’s next book about  what else?  blended families. You can buy Single Mom Seeking here or better yet, from your favorite independent bookstore. What better Mother’s Day gift for those strong mamas out there going it solo? A must read for single dads, too!